WASHINGTON — In his first extended interview since he left the White House last month, Stephen K. Bannon was unsparing in his criticism: calling out top Republicans, West Wing staff, the “pearl-clutching mainstream media,” special counsel investigators and the Roman Catholic Church. Pressed by the interviewer, Charlie Rose, Mr. Bannon said that had Mr. Comey not been fired, the Justice Department investigation into possible links between the Trump campaign and Russia’s election interference would not have been handed over to the special counsel, Robert S. Mueller III. “We would not have the Mueller investigation and the breadth that clearly Mr. Mueller is going for,” Mr. Bannon said. Mr. Mueller is said to be investigating whether Mr. Trump obstructed justice in firing Mr. Comey. The assertion, made in an online-only segment of a wide-ranging “60 Minutes” interview that aired on Sunday night, was perhaps the most extraordinary of many criticisms made by Mr. Bannon as he sets out to reclaim his mantle as Mr. Trump’s most prominent outside supporter from his perch as the head of Breitbart News, the far-right website. for the entire time” he is in office. 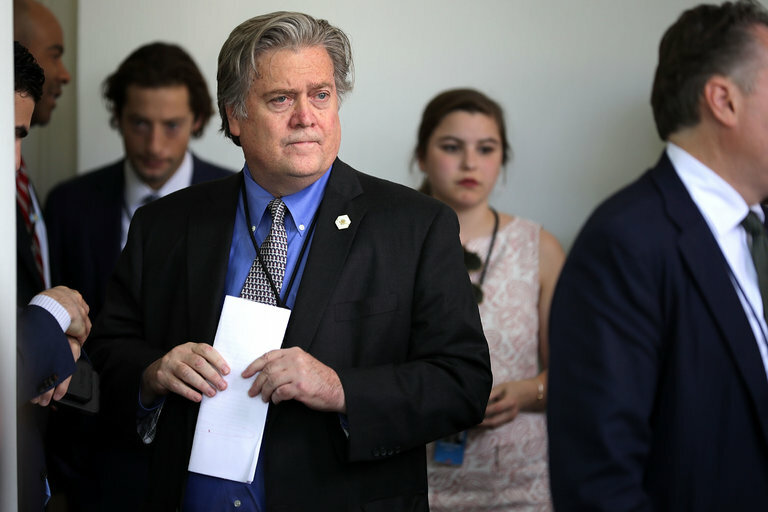 Mr. Bannon left the White House on Aug. 18 after a year first as Mr. Trump’s campaign chief and then as his chief strategist in the West Wing. He returned the same day to his previous role as chairman of Breitbart. Mr. Bannon predicted deep division within the Republican Party over Mr. Trump’s recent move to end the program that provided temporary relief from deportation for hundreds of thousands of young people in the United States illegally. The president set a March end date for the program and asked Congress to come up with a solution in the meantime, a task that Mr. Bannon said could split Republicans and cost them their House majority in the 2018 midterm elections. “If this goes all the way down to its logical conclusion, in February and March it will be a civil war inside the Republican Party,” he said. In the interview from his Washington home, Mr. Bannon reacted defensively when asked whether his clout in the White House had diminished by the time he left. “I had the same influence on the president I had on Day 1,” he said. His departure was hastened by Mr. Trump’s growing weariness with the image Mr. Bannon cultivated as the architect of the president’s populist agenda. Mr. Bannon, who is often critical of those he sees as Washington careerists hostile to Mr. Trump, has become famous for his polemics that critics see as reflections of the president’s impulses. Mr. Bannon also condemned top officials in the George W. Bush administration, calling them “idiots” friendly to what he termed China’s anti-American economic agenda. He singled out Condoleezza Rice and Colin L. Powell, former secretaries of state, and Brent Scowcroft, an adviser to Mr. Bush and his father, as those most worthy of his scorn, criticizing them for China’s 2001 entry into the World Trade Organization. But he declined to answer when Mr. Rose asked whether Jared Kushner, Mr. Trump’s son-in-law and a White House senior adviser, was responsible for the dismissal of Mr. Comey. Mr. Bannon seemed eager to pursue anyone who has crossed Mr. Trump. He said he was the president’s only defender after the racially tinged violence in Charlottesville, Va., last month, when Mr. Trump was widely condemned for statements that likened white supremacists to people protesting them. Yet Mr. Bannon accused neo-Nazis of “getting a free ride off Donald Trump” for their role in white supremacist rallies. Mr. Bannon told Mr. Rose that he did not “need the affirmation of the mainstream media.” Neither does Mr. Trump, Mr. Bannon said. Very informative article about President Trump’s campaign, you have posted very nice news which i like it a lot. I am impressed to see your website. In the all political person together and important decision for here. I am appreciate in the work. I would like to say that the article is really very good. keep it up.